This is produced by Journalism & Studio Production students. 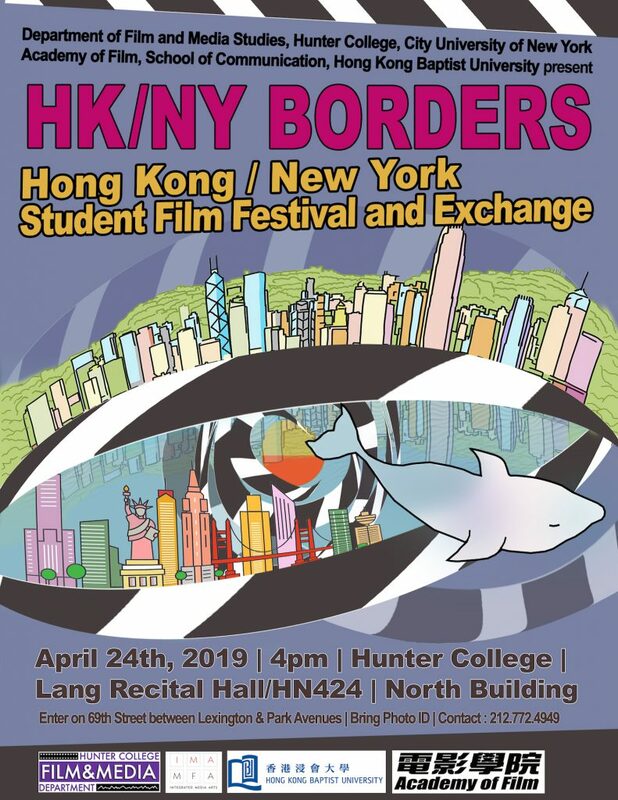 The Department of Film and Media Studies at Hunter College is pleased to announce “HK/NY Borders.” This upcoming event will bring together students and faculty from Hunter College with a group visiting us from the Film Academy of Hong Kong Baptist University, one of East Asia’s premiere film schools, for an exciting evening featuring the work of undergraduate and graduate students from each program. Jumping from the nation’s 183rd television news market to the number one market in just one year is pretty much unheard of, but not impossible if you’re Jessica Cunnington, now a News 12 anchor and reporter. 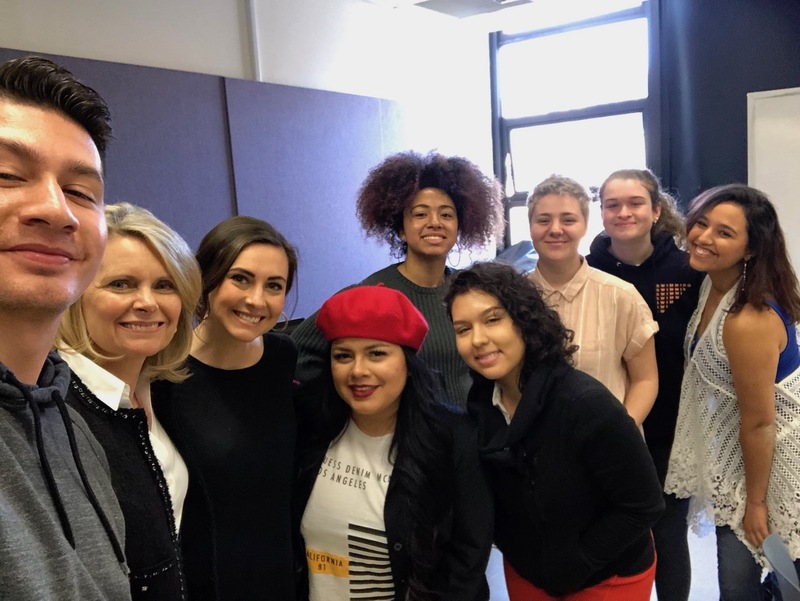 Cunnington talked about that meteoric rise from her entry level reporting job in Charlottesville, Virginia to New York’s News 12 with Professor Sissel McCarthy’s “Hunter News Now” students last Wednesday. After Cunnington graduated from the S.I. Newhouse School at Syracuse University in 2012, her goal was to be working as a reporter within six months somewhere on the East coast. It didn’t take that long. By August 2012, she landed a job as a what’s known as an MMJ (multimedia journalist) for CBS19 in Charlottesville. 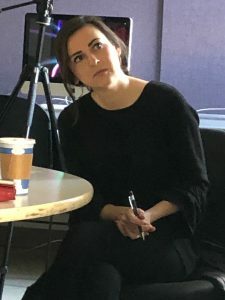 There, she learned to report, write, shoot and edit all her own stories and within a year, she had the experience and show reel to make a big jump back to her hometown market, New York City. 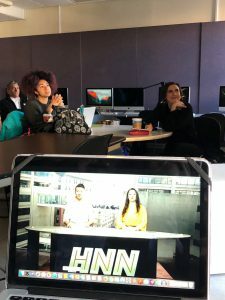 Cunnington shared her reporting and anchoring expertise while watching the second Hunter News Now show of the semester and praised students for their storytelling. “The techniques you’re learning here will really help you in when you get your first job,” Cunnington said. “My approach is to let the people you interview do the talking. Reporters don’t need to talk as much as you think.” Some of her more practical tips include: think about adding nat sound at the beginning and throughout your story, always use a tripod, shoot your interviewees on the tight side, usually from the collarbone and up unless you need to show something else in the shot, avoid too much head room, use dissolves to smooth out the audio and smile when you’re anchoring. She also said everyone gets better with practice and that’s why that first job in a triple-digit small news market is invaluable.